Chengdus & Don'ts: Hot Pot the Cuisine of Sichuan! Hot Pot with Chicken Broth and a very Spicy Broth. I am doing a bit of back posting as we have been very busy with the move. 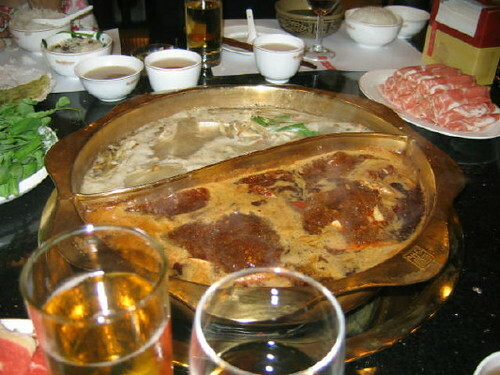 A week ago I was able to try Hot Pot, a very famous cooking style in the Sichuan Province. 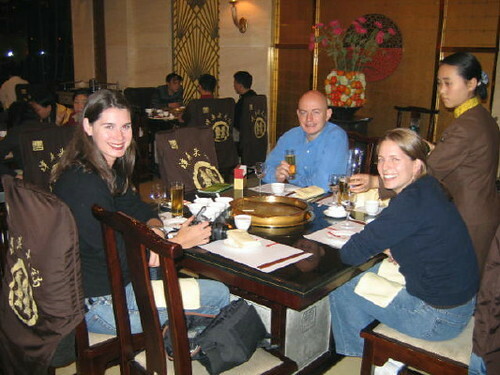 Reed's cousin Molly was on her last night in Chengdu and wanted to try this delicious delight. They heat the broth/oil in a pot in the center of your table and add whatever you order to the pot, similar to fondue with more intense flavors. Reed, our professional orderer, ordered mushrooms, two types of tofu (one was this fabulous spongy type), chicken, lamb, beef, and some greens. It was so yummy! I haven't tasted anything quite like it. 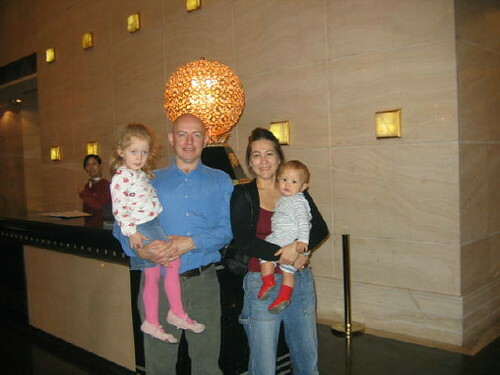 Jonny with Molly and Reed. 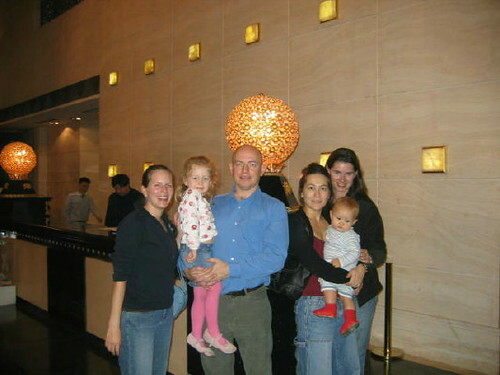 Here is a family shot for the folks back home! Here we all are after a fine meal! Thanks for making my trip to Chengdu so memorable and for helping to kick me out of China - I mean give me a proper send off on my last night. This meal was so fantastic -and something that everyone needs to experience for themselves - that I have decided to open a Hot Pot restaurant right here in Chicago. Instead of the usual Chinese fare, I will be offering items more suitable to the refined Chicago palate - bratwursts, hot dogs, deep dish sausage pizza and any other sausage/meat product I can think of. I will even throw some blood sausage on the menu in Jonny's honor. So glad to see some fresh pictures of you smiling faces. Gemma's feet look like ski's! Has she already grown that much?